I have battled with dry and frizzy hair my whole life. I’ve tried various shampoos, conditioners, hair masks, serum.. nothing work. When I received the sample, did not think much of it and just give it a shot. I am amaze with the results after using it for only 2 weeks. My hair is softer, shinier and it totally tames the frizz! I am also a fan of the scent of lavender and this is the perfect product for me. The first thing which caught my eyes was the dainty prints and pretty olours on the recycled plastic bottles. Thumbs up for the green move! The scent was pretty amazing as well, albeit the lavender smell was not as strong as I preferred. The shampoo and conditioner were average, it did a clean job in removing grease on my hair and scalp. Great smell and texture. Enjoyed using the shampoo as it helps me relax especially before bedtime for a good night sleep. I am extremely stoked to be trying out this product, by Unilever, can you believe it!! The packaging threw me off guard, it is absolutely lovely; makes me want to use it immediately. I was thrilled to find my favourite scent - Lavender, in this range. I don’t like shampoos which leave a very strong after-shower scent, I find them too artificial. Instead, for this product, the scent is prominent during the shower, (which is super awesome as it makes you feel calm after a day’s work), but leaves no annoying “perfume” in the hair like other shampoos. It also combines really wonderful ingredients, in fact two of my favourite for hair care - Organic Coconut Oil and Argan Oil. For all that nourishment, the conditioner, (or the shampoo) doesn’t leave any greasiness behind and the best thing is that it does NOT contain silicons, dyes or parabens, (thank god). 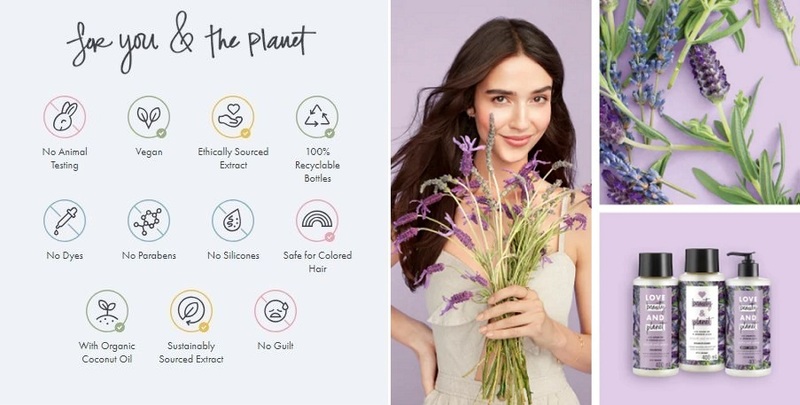 I really like the fact that this range of product tries it best to make difference to environment, by using naturally derived ingredients. Even the bottle is made from 100% Recycled Materials! How cool is that.